What I find inspiring about Julia Child was her sense of humor. I remember seeing her use a Kitchen Aid and the flour going everywhere. She also had this ease about her in the kitchen that made me feel good. It reminds me of the well-known photo where there is a man sitting in a low cupboard handing Julia something while she is taping her show. TV production has come a long way from then. I also remember the Saturday Night Live skit that Dan Akroyd did. I am not the only one who thought she had a sense of humor! One of my personal keepsakes that I treasure is a signed copy of “Mastering the Art of French Cooking.” My wife got it for me when she was taping an episode of the Wolfgang Puck show. She was fortunate enough to meet with Julia in Santa Barbara. It was exciting that she got to go and had the fore thought to get my copy signed. I will always treasure it as well as the memories I have of Julia’s spirit and cooking! 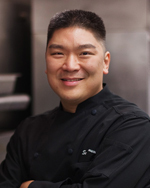 A graduate of the French Culinary Institute in New York City, Executive Chef Seisuke (Seis) Kamimura brings more than 20 years of experience in the food service and hospitality industries to Chef and Restaurateur Michael Mina’s first Pacific Northwest wine bar and dining establishment, RN74 Seattle. 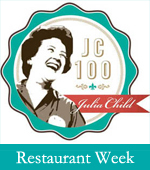 Julia Child Restaurant week features more than 100 restaurants across the country and honors the contributions and legacy of Ms. Child. Events will kick off on August 7 and run through her 100th birthday on August 15. Each restaurant will feature special menus or events inspired by the 100 most beloved Julia Child recipes. To learn more and see what restaurants are participating near you, visit: jc100.tumblr.com.